Background: Laparoscopic pancreatic surgery for pancreatic disorders includes enucleation, distal pancreatectomy, pancreatoduodenectomy, and cystgastrostomy. However, these procedures are still uncommon, with limited indications. If postoperative complications such as a pancreatic leakage occur, they can be potentially serious. 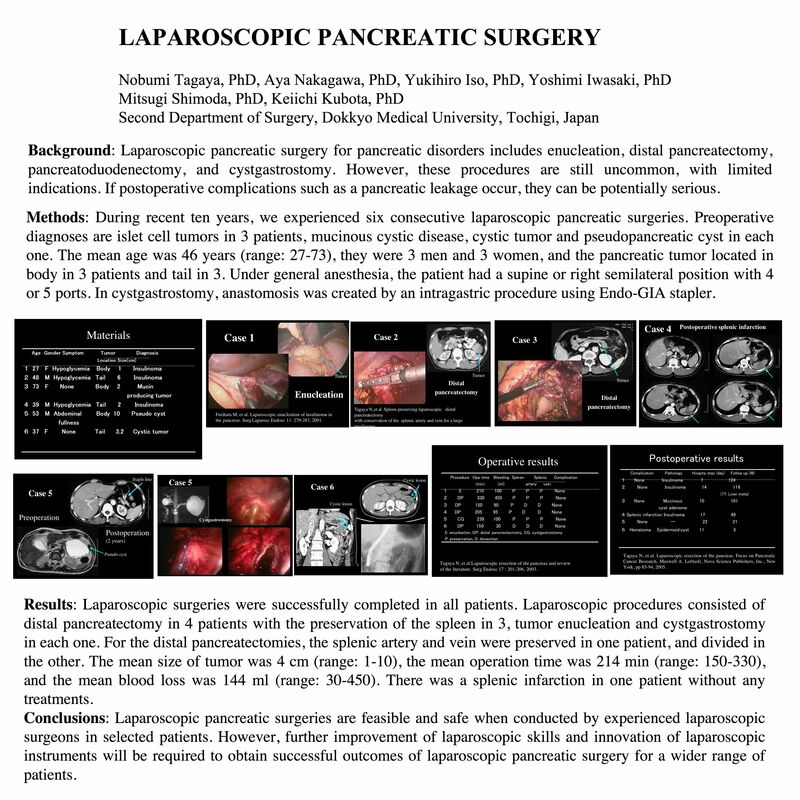 Methods: During recent ten years, we experienced six consecutive laparoscopic pancreatic surgeries. Preoperative diagnoses are islet cell tumors in 3 patients, mucinous cystic disease, cystic tumor and pseudopancreatic cyst in each one. The mean age was 46 years (range: 27-73), they were 3 men and 3 women, and the pancreatic tumor located in body in 3 patients and tail in 3. Under general anesthesia, the patient had a supine or right semilateral position with 4 or 5 ports. In cystgastrostomy, anastomosis was created by an intragastric procedure using Endo-GIA stapler. Results: Laparoscopic surgeries were successfully completed in all patients. Laparoscopic procedures consisted of distal pancreatectomy in 4 patients with the preservation of the spleen in 3, tumor enucleation and cystgastrostomy in each one. For the distal pancreatectomies, the splenic artery and vein were preserved in one patient, and divided in the other. The mean size of tumor was 4 cm (range: 1-10), the mean operation time was 214 min (range: 150-330), and the mean blood loss was 144 ml (range: 30-450). There was a splenic infarction without any treatments and an intraabdominal hematoma required percutaneous drainage in each one patient. Conclusions: Laparoscopic pancreatic surgeries are feasible and safe when conducted by experienced laparoscopic surgeons in selected patients. However, further improvement of laparoscopic skills and innovation of laparoscopic instruments will be required to obtain successful outcomes of laparoscopic pancreatic surgery for a wider range of patients.